Live @ ATP is a collection of the songs played during the performance of Boards of Canada at the 2001 All Tomorrow's Parties. Although unofficial and never released by Boards of Canada, they can be found widely on file-sharing networks in their complete form. As with all of their current live work, the collection includes songs that had never before been released and were unnamed. All Tomorrow's Parties is an annual music festival. The 2001 edition, curated by Tortoise, took place at Camber Sands Holiday Centre, New Lydd Road, Camber Rye, East Sussex from April 6 through April 8. Boards of Canada performed on April 7th. Track 1 was revealed as "Echus" when a snippet was featured in the 2009 All Tomorrow's Parties documentary. Track 3 is essentially the same piece used by Chris Cunningham in the Telecom Italia ad "Quiet", and is often mislabelled as "A Is To B As B Is To C". Track 6 was used exclusively as a loop on the Boards of Canada webpage circa 2000 and 2001. See the web loops video below. Track 11 is also often mislabelled as "A Is To B As B Is To C". Recordings from this concert were never released. However, an audience bootleg from the show is widely available on mp3. Unfortunately, the quality is low, with heavy distortion in the lower frequencies. A recording of Julie & Candy from the set, seemingly made direct from the soundboard, has also surfaced via YouTube. An attendee to ATP has said the video actually contains the same visuals projected/shown in the performance shown below . The song was posted by user AtalantaFugiens. The source for the audio and video is unknown, but the video is on the favorites list of the official BoC YouTube account. "Wasnt easy. I sewed the recorder into my jacket and microphone down the inside of my sleeve." "They were being real crazy about recordings and cameras....they had security taking discs and film. Pointing flashlights at people taking pictures." "Yeah I know the quality gets bad...I think it may have been a mix of being to close to the speaker and they seemed to get louder as the show went on. I had just purchased my MD right before my trip to Europe so it may have been a lack of experience with it as well. I got the AE set as well as some clips from some of the other performances. I think I still have the master MD's somewhere. Might be able to retransfer it and remaster eventually." "At the time BOC was the highlight for me...since I had never seen them before...nor since. It was right after IABPOITC came out. My first time to EU. Day after I recorded the set I took a walk through the actual BPOITC that surrounded the festival venue and listened to the set. It was quite surreal." On July 4, 2009, a new user named terekhova came forth on the Twoism forum with a partial recording he made at this show. While this recording consist of only two tracks, it has significantly better sound quality. "I was further back than the guy who did the recording that has been doing the rounds, just to the left of the sounddesk, and the sound is pretty good. "It was a tiny Stereo Electret mic borrowed from a mate. I'd brought a bigger Sony minidisc mic along to that ATP but it was a little obvious and his smaller microphone was easier to hide. 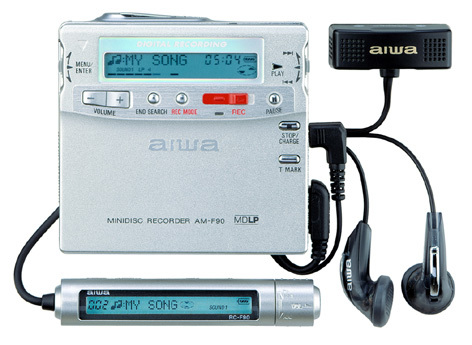 I think it was an Aiwa mic that came with his MD recorder (something like this one)." This page was last modified on 22 February 2019, at 00:35.